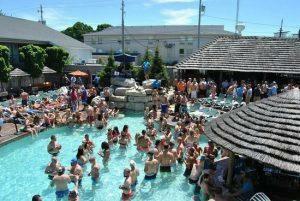 The Commodore Resort combines partying and luxury to create an unforgettable summer on Put-in-Bay. CHECK AVAILABILITY! With a wide range of room options, groups from two to eight are all welcomed here. The rooms are stylish and comfortable. Each room is well-appointed with all the necessities one needs for the summer. You can MAKE A RESERVATION for the Commodore Resort easily by clicking that link. The King Jacuzzi room is one of the Commodore’s signatures. This amazing room features your very own jacuzzi, big bed, and flat screen TV. A perfect place for a romantic getaway. The Commodore campus includes two buildings. The original building includes smoking rooms. Large groups sleep easy in rooms with 3 to 4 double rooms. Each room comes equipped with modern conveniences for all your needs. Golf cart rentals are available for guests to tour the island. The ideal way to get around, Put-in-Bay, enjoy zooming from destination to destination. There is no end to the attractions of Put-in-Bay. If you feel like spending most of your time at the Commodore, there are plenty of things to do! Home to island favorites such as Mr. Ed’s Bar and Grill, The Green Room Nightclub, and the fabulous swim up bar, MIST. MIST keeps the party going on day long with DJ’s spinning, private cabanas available for rental, and delicious cocktails. Every night features a fabulous light show. Mr. Ed’s dishes out incredible food, live music, and a friendly atmosphere. The Green Room keeps you dancing into the wee hours. It is also available for private parties. Subway is located in the lobby of the hotel so you can grab a quick, healthy bite before heading back to the pool or out on the boat. Come spend your summers at The Commodore!